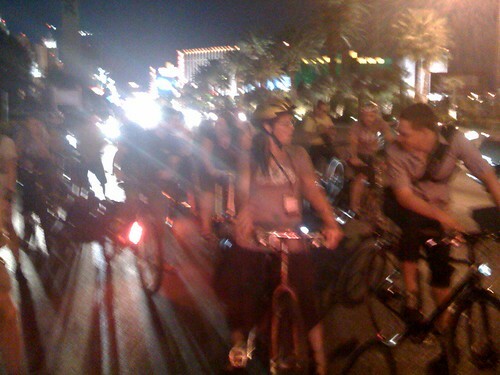 Last Thursday night the 2008 Interbike Mobile Social kicked off at the Sands Expo center where about fifty of us met to ride down Las Vegas Blvd to the Criterium races at Mandalay Bay, about a two mile trip down the craziest street I’ve ever ridden. I was riding a Dahon folder (great fun) as were my cohorts, Fritz and Guitar Ted. Also in for the ride was the whole Dahon crew, a half dozen folks from Xtracycle, the Fossil Fool bike rapper, the owner of Yuba and a smattering of other folks. We headed out about dusk, took up a whole lane of the strip and made our way slowly to the race. We got lots of weird looks and cat calls, but it was all in good fun. It was fun to see the eclectic group of people and bikes. I would say 2/3s of the folks were either riding folder bikes or cargo bikes of some sort. Only about half were wearing helmets and we were all having a grand ol’ time. Once we arrived at the event, we all parked the bikes, partied and watched the races. There was lot’s of entertainment to be had while riding all the bikes around and listening to Fossil Fool. There were also plenty of quasi-celebs around in the ways of Byron of Bike Hugger, David of the FredCast Cycling Podcast, Fritz of cyclelicio.us, Guitar Ted of Twenty Nine Inches and few more I can’t remember through the Vegas haze. Also, I wanted to give a big thanks to our sponsors for the Mobile Social… JensonUSA and Sportgenic. If you need to buy stuff, or want to make a little extra cash on your blog, you should check them out. Around 11pm Guitar Ted, Fritz and I decided it was about time to head back down the strip. The problem… all we had for transport were bikes and none of us had brought along helmets or lights. After a bit of arguing and Ted calling me a ‘pansy’ a couple times, we headed out. It was a pretty exhilarating ride as we pedaled as fast as the Dahon’s (and mine with 20 inch wheels) could take us. Thankfully there were no close calls and about halfway down the strip we hit traffic and were able to roll with the cars the rest of the way. I would tell you that you were an idiot for doing it, so yeah, I know! But it is what it is, and it was an epic night for sure. So the 2008 Interbike Mobile Social is on the books and we’re looking forward to doing a couple more in select cities in 2009. Yeah, I have fond memories of riding the strip at the 95-97 Interbike shows. It’s always a thrill. You forgot to mention the alleycat that started shortly after us. We’d hear a cacophany of honking, a group of fixie riders would fly by us shortly thereafter, they’d do their checkpoint thing and then leapfrog our slow group. There’s a reason I kept myself in the middle of our little peloton during our late night ride — Tim in front to stop those pulling out of side streets and driveways, and Guitar Ted behind to absorb the impact of rear end collisions. To our readers: All of us had actually brought lights with us knowing about this ride, but they were all back at the house we stayed at. This is good stuff. I can’t imagine riding the strip at night. I have my own problems riding bikes without adding darkness and high traffic. And Fritz, good thinking on the middle of the pack. I would have done the same thing. I actually live in vegas and commute down part of the strip every day. I can only imagine what it would have been like riding the strip at night with no lights … lots of fun! Well, to be honest, it was the fact that Tim and Fritz had gears on their rigs and I was on a single speed, mostly spun out, that kept me off the back for much of the first part of our trip back. I don’t know, I’ve been caught up in some crazy traffic situations before, some far more dangerous than what we experienced at Las Vegas. I actually thought that the traffic was being rather civil with us, but that’s just me perhaps. Not saying we were not stupid and wrong. We were. But it wasn’t all that bad either. Riding the Strip at night was pretty dang cool. Glad I had the opportunity to do it. We were mostly well behaved — we followed all of the traffic rules (well, except the part about adequate lighting) and usually queued up behind traffic. The motorists around us were mostly cool with us. The only honks were directed at the alleycat cyclists running red lights. The only truly stupid riding was by Yours Truly, when I drafted at 20+ mph for a short while behind an automobile with my little 20″ wheel folding Dahon.